Raised Greek Orthodox. Baptized Protestant - Mormon - Catholic. Receives mission from Christ in the BORN-AGAIN EXPERIENCE as with Franklin Graham. Spends hour with Pope John Paul with a Senator's secretary outside Christchurch to witness a Fatima event in 1986. A STORY OF SPENDING AN HOUR WITH PRESIDENT-TO-BE- REAGAN IN 1980 @ SMU AND SPENDING AN HOUR SITTING WITH POPE JOHN PAUL II IN 1986. BEING CONFIRMED IN ECUADOR IN 2006 WITH THE ARCHBISHOP WHO ALSO SPENT AN HOUR WITH THE POPE A MONTH LATER AFTER 1986. 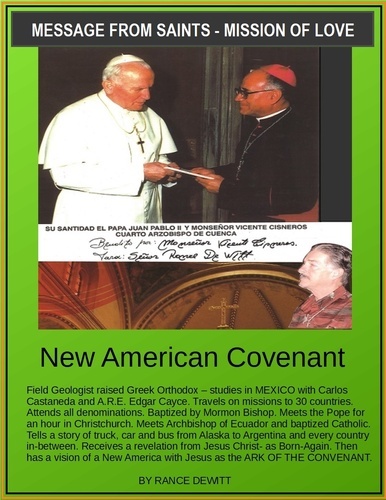 WE REALIZED THAT ST JOHN PAUL AND RONALD REAGAN ARE BOTH SAINTS WITH A MESSAGE TO AMERICA OF A NEW AMERICAN COVENANT FOR ALL NATIONS FROM ALASKA TO ARGENTINA. MESSAGE FROM SAINTS is to the bishops of North and South America from Saints John Paul and Ronald Reagan. A message shared with Archbishop Cisners and the author after each spent and afternoon with the Pope- Christchurch and Quito. Our story-telling adventure recalls Marco Polo spending 20 years in China with Kublai Khan. And another Christian called True Believer who made a similar journey in Pilgrims Progress. This journey is from New to Old and from Old to New and back again in North and South America and Europe like Christopher Columbus and Amerigo Vespucci. A venture that begins…..
Hitchhiking from Dallas in 1967 to the Bahamas to fly to Europe from high school then to Mexico for University in the land of the Toltecs studying the Path of the Warrior and the Way of the Shaman with Carlos Castaneda teaching in the mountains. Then after a year of travel and study in Mexico to return from total immersion into the esoteric realm of ancient spirits called the Death Defiers and shape-shifting animal spirits too. But return in despair and dismay to seek absolution out of that deep dimension of human history to having the Born-Again experience and walking with Jesus Christ in the similitude of a dream that was written in vivid memory like a Shakespearian play and never to be forgotten. This teenage voyage thru Europe and Mexico transformed into a mission path later being sent back to the Old World of Greece and the Mediterranean by my father and the Greek Orthodox Archbishop in Dallas. A mission that would lead me to meet Pope John Paul II years later. But Orthodoxy was followed by attending every Sunday school in every Protestant denomination in Dallas. Baptized by the Methodists @ SMU, baptized again with the 7th Day Adventists in Yakima and then with the Mormon Bishop in Ellensburg to finally completing Pilgrim's Progress with a final baptism from the Catholic Archbishop in Ecuador. But the key event in all these missions was having the Born-Again experience like Franklin Graham describes and then in 1986 meeting and spending an hour with Pope John Paul II in Christchurch. The Born-Again-Experience in 1970 was a voyage OUT of the Sorcery and Shamanism of the Ancient Ones studying those arts with the Indians in the Land of the Toltecs south of Mexico City. But it had nothing to do with Voodoo or dark magic popular then with the French tarot cult of the Caribbean. It was almost a college major with Carlos Castaneda as our teacher. Here we must explain the genre of this book as story-telling from the second level of speaking in Toastmasters International. For instance…Tommy Robbins is a story-teller speaker whose original 10 hour audio lectures were an inspiration. Tommy did many years ago something I did too and have never heard anyone do it since. He created a SÉANCE with his library books and arrived at a communication with the extant authors. I did this with all my Greek and Roman saints and literary scholars too. But this was because I had been raised in the A.R.E. Edgar Cayce group of seers who communicated with people in the Netherworld. But the event became significant because it was a year-long propitiation to the saints and such on a Walden Pond with a giant table creating a séance to speak to these people. This is probably why the title to this book is called Message From Saints. The dimension we are crossing is the medium between message and messenger. Is an author the message or the messenger? I try to cross that river by explaining my teacher in Mexico Carlos Castaneda whose advanced methodology for example was sleeping with a group of his Nagual allies as he called them out in the desert where they all woke up while asleep in a cognizant dream and went off into another experiential world and then return to the house and all wake up as a group and discuss the world they traveled thru … together. 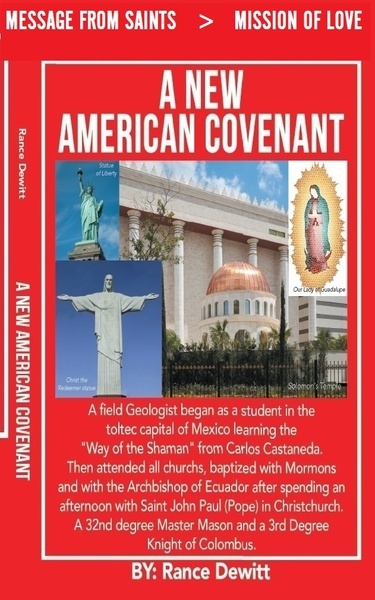 My year in the deserts at a Mexican university was literally a separate reality following several years in high school with Edgar Cayce’s group of seancers and like-minded people during elementary school and attending with my Centennial master-Mason Eastern Star grandmother her Mary Baker Eddie Christian Science reading rooms. This synopsis of the book is only an overview. But the essence of Message from Saints is to contrast Message with Messenger. Here is a Masonic-based emblem from Michelangelo that explains the relationship of PERSON as it is described in linguistic evolution. Our year of college there had little to do with official classes, except for our fencing team. It was essentially an anthropology exercise into the belief systems of the ancient ones of Mexico associated from traveling the mountains with the Indians by horseback and traveling by van nearly every city, village and ancient site. We were literally living out the books that Carlos Castaneda was writing for his New York Times bestselling readers. We simply decided to join the Aztec, Mixtec, Toltec, Mayan, Olmec and learn for ourselves. This mission-story continues in Greece traveling thru the Mediterranean Islands on a Vespa scooter w/sleeping bag. Sent by the Greek Archbishop of Dallas, that also led to several supernatural encounters with the ‘Ancient Ones’ of Greece and lastly a preliminary encounter associated with the new Polish Pope. The top of the pass in the Danaric Alps was still rutted with winter snow in Spring making it impassable for a Vespa. So I stayed with the Orthodox community in Pristina, Bosnia for a few weeks in 1981. My connection there with the Pope began by engaging the Soviets teaching them at their NCO club how Texans play pool like Paul Newman and Steve McQueen. And that was fun. But at the government hotel they had cartoons made against the Pope to justify hiring an assassin to shoot him that month across the Adriatic in Rome. They broadcasted their intentions for reasons of justification. It was obvious what they intended to do. But I objected to their obvious intentions. So they said if I didn’t like it then leave the country. So I put my socks on my hands and pushed my Vespa half a mile thru the slush on the pass to Austria. It is no coincidence all this happened. They shot the Pope and Reagan in the same time frame. Reagan said after Poland sent their man to Rome that he could be the key to bringing down the Soviet state and saving Russia. Evidently the KGB knew this too as a threat to their deep state swamp. Oddly this place where our confrontation happened would at the same time as his assassination event would be site of the apparition of Medjugorje. So we try to explain what Medjugorje is and what Fatima wasn’t’ as Saint John Paul later said that Medjugorje will save America. Somehow I became a player on the world stage of high stakes drama in Medjugorje. This was confirmed 4 years later in New Zealand when Pope John Paul and I were there together. Here the next supernatural event that would compete with the Born Again experience occurred. A call it the Fatima event that came out of the sky while sitting with Pope John Paul II. The next chapters describe the year following graduation in Geology and going to Australia to work as a field Geologist for CSR north of Darwin on the islands. But changing course spending months working and driving to all corners of the country to leave it all for South America. But while waiting a week in Auckland for a plane to Buenos Ares fate and fortune would intervene. The science of mysticism from Edgar Cayce and Carlos Castaneda was joined together with Geology as two different sciences after the few months throughout all the Outback learning all about the Aboriginals starting with a short stint in Anthropology at the Masters program at the University of Sydney. The story jumps forward a decade after Australia and sitting with the Pope in New Zealand with a few months hiking around South America, then flying up to McGill University in Ontario and busing across to British Columbia. Then continues with a decade of fish farming, aquaculture and aquaponics. And in two stages driving a work truck from Anchorage all the way to the Panama border and buy a hectare of land for a fish farm on the Bay of Tarcoles in Costa Rica after studying in prawn farming in Taiwan and Texas Sea Grant College. By then the ’81 Bosnia and the ’86 John Paul events were forgotten. But another supernatural event would summon their memories at a science convention in British Columbia. Our Washington Senator Swecker, in charge of Salmon Recovery and the Director of Fisheries at UW, Ken Chew invited me to a 3-day $500 a chair conference called How To Save The Oceans And The Seas. I carried the microphone (in lieu of paying $500) to the 1,000 top scientists, provincial governors, mayors and fish farmers (and Indian tribes) from the Atlantic to the Pacific, from Maine to Taiwan until lastly it came to end of the 2nd day and the last question from the audience- for the panel of experts on stage. This was when a voice from above ordered me to speak and tell a story about Archimedes and Jules Verne and my trout farm. Later I realized it was a wakeup call from the Pope about the NZ Fatima event we witnessed together. So this changed the course of everything. I carried that speech on a few competition talks with Toastmasters in Washington and Europe. The little speech I was compelled to speak became a subject of talk at Toastmaster’s International clubs in England and Spain by getting my attention that spending a personal hour with Pope John Paul II and witnessing a repeat of Fatima is not something you ignore. And in Spain, a few years later, I got my orders from the Pope to begin the mission. A mission that would start in Venezuela. Then go to Ecuador and Columbia with three presidential families. So much for saints holding all the cards! THE PURPOSE OF THIS BOOK - ENLIGHTENMENT! Our purpose in speaking and writing this book of journeys is to explore the serendipity connection to all the events which leads us to the ASSUMPTION of Saint John Paul as saint crossing the medium between messenger and message And what that means and why and how that possibly happens. Presuming he knows more now wherever he is than what he knew here as pope. We also petition his one and unique personal American co-Saint Ronald Reagan…. to help save the world in the future by saving America and all the nations of the Americas in the New World Covenant. By understanding the errors of the past from Mussolini of Roma to Hitler of Germany and Lenin and Stalin – planted (by train) into Russia and to Mao in China. Was it an act of God- or did it come from the Dark Side. And what is the lesson? Esoterics. We can enjoy in our library of seancers the great writings of Madam Blavatski and her 7 volume encyclopedia that followed her seminal book ISIS UNVEILED. Is there a bit of prophesy here? Perhaps. But more importantly we separate the dark magic of the Voodoo and Tarot card readers who dealt all of Hitler and Mussolini’s hands from Marx and Engels. And draw the line more with Nietzsche to find the golden mean or middle way. We say Fatima failed from the start with months of boiling the children in oil (in pseudonym). The church had been lost to Musollini and would never return- as Morris West told in his book about the Slavic Pope replacing the Italian with ‘Shoes of the Fisherman’. West who was so correct like Malachi Martin became not a Vatican exorcist but correspondent. So, the ONLY saint in heaven who had the great commission to save the world from a Failed Fatima- named after Mohamad’s daughter in Port-u-gal. Three children were called by God with a message ABOUT Fatima. But were systematically imprisoned and boiled in oil (threatened to be). And this played out prophetically with 20 million people in Europe, Russia and China being boiled in the oil of the War Machine- prophesy is fulfilled. FATIMA WAS AN ABORTION. Fatima is the remnant spirit of 700 years of Muslim occupation. And occupation of the Mediterranean that sowed slavery on Yankee traders and sowed slaves into the New World. Fatima was not the solution- Fatima was the problem. Fatima was the face of slavery that immigrated into Europe and the West with a form of Voodoo that would morph into Communism when Lenin’s train landed in St. Petersburg. John Paul and Ronald Reagan must now be more than Saints in Heaven and examples of good work accomplished in 1987, but rather they must now be true guides- from the metaphysical- in saving the world from the future extension of a New world Order vying to replicate Fatima and the errors of Fascism called “Iron’ in the bible and Communism called “Clay’ – the two legs of a man that Jesus does not know- except His previous dealings “in the desert”. No my friends….. Christianity like our language that came from Greek and Latin are creations before the mast of Peoples of the Sea and not gypsies, nomads, sheep and camel dwellers in the desert. This is the true line in the sand in human evolution. So, the book walks us through the past -into the future- in harmony with the Idea of a greater Church called God’s House that includes Catholics, Mormons, Jehovah’s Witnesses, Greek Orthodox and all the denominations of Christianity welcoming kindred Hindus and Buddhists- all the while remembering past teachers like Cayce, Castaneda, Mary Baker Eddie, Ellen White, Churchill, Ratzinger, Eckhart, and Malachi Martin... Mahatma Gandhi and all those who wrote and thought from the Spoken Word with the Greek. And the written word in Latin as with our historical Saints. Thus we begin our journey.. into the Past... and into the Future. President Kennedy came to Dallas in November 1963. We got out of middle school to bus downtown to see him. The streets were crowded so my friend and I ran ahead of the motorcade to across commerce street from the Book Depository Building and the Old Historic Court House. We ran up the big stone stairs up to the first floor window that was the Judge’s office inside the open court and asked if we two kids could sit on the huge sandstone ledge of the 5 ft wide open window to watch the president. He laughed and said OK. So we did. But the action on the street didn’t make sense because the motorcade came and then without any reason just sped away. We were disappointed and thanked the judge and spent the day touring downtown Dallas and going to the tallest building then, the Southland Life building and taking an elevator up to the top floor city observatory was told by a well-dressed gentleman that the president had been shot. I was startled but not shocked. The reason was downtown Dallas. We were a couple blocks up from Jack Ruby’s night club and a Greek and Italian deli where my parents would visit with their favorite Greeks and Italians. Those were our two favorite groups of people there when Dallas was a discrete collection of ethic communities retained their cultural identity. To the point that my dad sent me to Greek elementary school at the Orthodox Church. And there was a lot of ‘political commentary’ those days when kids dived under tables at school when the air-raid sirens went off weekly. But we also marched outside of school too and saluted the flag with the Pledge of Allegiance – to our country and not to political con artists. To the point that my dad as a contractor built a large bomb shelter under our front yard with a tunnel leading out from the house. Living in Texas in close proximity to Cuba was serious business in the ‘60’s. Not to say the Greeks, Irish and Italians who gathered together so tightly were necessarily against Kennedy, they just had a lot of mixed feelings of what was going on with the Cuba situation. And attending night clubs with parents on weekends was educational listening to the lyrics from the big bands, Sinatra watching parental ball-room dancers- especially if your mom and dad were like Fred Astaire and Ginger Rodgers. But Frank Sinatra and his rat-pack gang were also popular from Vegas to Havana. It was a cartel from the start that nearly ended the world with US-made Turkoman missals singing across the Atlantic. Yes, these were the days of the Big Band era and people like my parents went to ball-room dances every Friday and Saturday nite. Dance halls were like churches. So everything that happened in those days of the ‘60’s made social sense. These were also things you were taught to accept with a smile like the 9-11 event where hurricane-proof skyscrapers fell from airplanes made with aluminum foil and a lot of media shock and awe and a 60’s space capsule with 3 passengers had a Edsel size moon rover tucked in the closet that they lowered down to the moon with ropes along with enough scuba tanks to last a week rovering. Everyone “in the know” just smiled and thought of Walt Disney. In final, the people who got the last laugh was our Italian Mafia or Cosa Nostra with our reverential emblem C.S. for Con Sofos (with Honor). This is the place where Morris West would write his book Shoes of the Fisherman and declare to Rome- “there will be no more Italian Popes”. And he was right from Poland to Germany to Argentina. Get the drift? In Europe, I close encountered with three significant ladies. The first was Ingrid Bergman who starred in a little London theatre off the street in Haymarket called ‘Waters of the Moon’. I had just graduated from High School and sold my prize BSA Lightning Rocket 500cc motorcycle for $500 and bought a round-trip ticket from Nassau in the Bahamas to Luxembourg. I took a train to London and found on the street for sale while rooming with some Aussies a 1960 pre-unit re-buildable Triumph Bonneville 650cc and bought it for $75 and rebuilt the top end and had a new bike to ride. Bergman was playing in this little theatre I noticed so bought ticket and took a front row seat and waited for it to start. She was a star from start to finish. The play was about her and three others whose Rolls Royce breaks down far out in the sticks and they spend the evening and night with a poor farm family. Naturally, the show was to contrast the two cultures of rich and poor and it was a great play. The next beautiful lady I met was at the University of Vienna and her name was Prisca Thaller who was a student there. She had just finished her year in college and was leaving her apt for the summer. So we loaded up my backpack and sleeping bags on the back of the Bonneville after touring the city and visiting Sigmund Freud’s statue in the garden. Her home was in Munich. But we wanted to visit the alps and so traveled throughout Switzerland on the motorcycle and made a big circle around to Salzburg, Austria camping out in giant hay barns looking out over the alps listening to the Sound of Music that the hills were still alive with. Then we had to part in her home town of Munich for I had to return, my 3 months were done touring Europe on $5/day with the return flight leaving out of Luxembourg. And I had to go to Calais to put my Triumph on a boat to New Orleans. Munich is very patriotic as you would expect from the Sound of Music. The Munich beer halls have 100 gallon barrels of beer that lovely buxom women carry multiple mugs of beer on their arms to large tables of people who drink and sing their country’s songs. I was very sad to leave and we both cried on that streetcorner of goodbyes. Yet something remarkable was to happen while waiting at the Youth Hostel in Luxembourg that would save lost love. A beautiful Mexican girl came walking up the trail from the hostel thru the early Autumn leaves of that September where all the trees were in flowerful array. And we met face to face 20feet apart and it was love at first sight. On that wooded glade I took her hand and learned that there are two types of marriages- that which is ordained by God with grace, and that which happens to people in the general way of the world. This was from Grace. We had a week together socializing with all the foreign students planning our marriage and changing flight day to match to ride in the marriage-to-be coach back to the Bahamas. I had hitch-hiked from Dallas to Miami and had to do the same to return. My motorcycle would arrive a month later, so I hitchhiked to New Orleans and drove it back. But this chapter of the Sound of Music would continue. I contacted Consuelo Vicente Vidal in Mexico City. Her father was a government diplomat originally from Castilian. And made arrangements to start college in Mexico in Cholula, Puebla about 80 miles out of District Federal. Of course in those days… in the days of Woodstock…. we were hippies and I took a local friend with me driving his hippy van. We never ever used ‘hard drugs’ but experimented a little with pot and Peyote from the Indians. But it wasn’t to get ‘high’. We both were very well-read intellectuals already high on Augustine and Aquinas and Montaigne and Huxley… and the Road Less Traveled. So, who wants to lose their perspective ‘getting high’? No, we journeyed into other realms as Castaneda advised. Well this was good and bad. We enrolled in the university staying in the home of Senor Martinez who had Los Arcos Restaurant between Cholula and Puebla. This was a very significant place because we rented the top floor as college students and in front of the adobe home was a very significant work in progress. On the weekends groups of mayors and important people would come for lunch toasting El Presidente whisky and dining from a large stone kettle where they cooked cabritos from goat meat. Simply amazing. Some weekends I would travel to see Consuelo and we would tour Mexico City in her little hardtop 1957 Thunderbird convertible. Of course her sister would have to come along as a chaperone. But seeing Mexico City this way was a great treat because it was not yet over-populated or surrounded with dumps or controlled by cartel drug-gangs. It was like a regular American city. We went everywhere and did everything having Breakfast at Tiffany’s. Once when we were approaching the domain of marriage, her father took us in a chauffeured limo to have lunch with the President. Of course there were a lot of people, so we sat a table one stage down from the President’s family. But it was as fun as swimming in Senor Vidal’s Olympic pool. I think Martinez back at the house was a Shepardic Jew from Spain with a beautiful Indian wife, whose family we went and visited once who lived in Mexico City- and that was a real experience. But more fun was going to Lake Guadalajara where the Vidal’s had a summer home on the lake and learning how to ski with one ski. There was a problem though. It was the problem of serving two masters. My buddy Scarborough was intensely into the works of Carlos Castaneda… our real Mexican teacher, a nagual Anthropologist who left California to study his roots in ancient Mexico and took their religious drugs into excess. So, my detractor was successful in interfering with my marriage to Consuelo with his distracting 3-day weekend travels all over Mexico visiting the pyramids and communing with the Indians on peyote and mushrooms. I really was not too interested in all that, except we were buddies and both on the university fencing and saber fighting team (against U of Mexico) and there was never a dull moment in the contest of finding a sense of reality in all the cultural and spiritual dimensions we were constantly immersed. The course changed buying horses from the Indians to ride back to Texas up thru the Sierras. I began to realize what Einstein said about how Religion can leave the reality of this good world of family and Nature and become meaningless- if it is not tempered by truth and science. I guess that is why I spent 20 years reading studying true and good books of the earth called GEOLOGY. So, negotiating University, the Restaurant, traveling with the Sorcerers, riding our horses with the Indians in A Separate Reality, Journey to Ixtlan, Path of the Warrior, Way of the Shaman etc etc …. Castaneda’s recipe for success while courting the wife was not just a full plate- it was a contest between Good and Evil. Not to say Esoterics is evil in itself… but it is the Netherworld that can lead to darkness as well as light. And usually, as we see in history it is the former like when Governments become run by Voodoo practitioners with a smile and a grin to cover their malfeasance. It didn’t help that I was raised in Cayce’s group A.R.E., Association for Research and Enlightenment during high school. Which meant the ‘Way of the Warrior’ and the ‘Path of the Shaman’ was another experiential exercise. Perhaps this explains the attunement to Malachi Martin’s great lectures after being a Vatican Exorcist for 30 years. At year’s end we sold the horses and drove back to Dallas promising to return someday. So sad. I only later realized the utter folly it had been- forfeiting a love God had entrusted to me. Wow. That realization became a full-life consequence and a major turning point in experiential reality. Like a good mom who read bedside stories from Edith Hamilton’s Greek Mythology making at night, the hills around our country home alive with the Sound of Greek Music. And my centennial grandmother was an advanced Eastern Star Mason and Mary Baker Eddie teacher taking me each Sunday to her senior groups- all from the late 1800’s to play dominoes and canasta and sit and talk like Jesus did at 12 years of age in the Synagogue. But this was to groups of ladies at the Christian Science reading rooms. Yet, like Cayce’s group of A.R.E. naguals, most of those seers were Phd’s and quite serious in their seances and such- at least in the eyes of a high schooler. But like they used to say: “Everything I ever needed to know- I learned in kindergarten”. So, it was after leaving Mexico- without marrying the wife I met in Europe to the Sound of Music whose father in Mexico was a presidential diplomat ….I awoke in Dallas from the Land of the Toltecs to a state a spiritual dismay. But the séance helped with a year of sitting before the Book and the books in dire pursuit of Jesus Christ to be my ONLY messenger from God… yes authors can be like Naguals but only when Christ is the light that shows the way to the Saints that you listen to. Today many are not familiar with seeking Christ as a spirit-guide like the Indians of Mexico would think of it. Many think the just believing or saying “they love Jesus” is equivalent to being born-again into His presence. Not so. Or walking down to Billy Graham’s pulpit saying “I want to know Jesus” is equivalent to ‘knowing’ Jesus. It isn’t. Jesus said “You must be born again” to be in his presence in an existential way. Yes, belief is important. But Religion doesn’t even come close. Our book explains historically why only a few walked the walk with Jesus in the ‘70’s like Franklin Graham witnessed. Now, in this New World America, Christianity must become ALL or nothing. The New American Covenant – Message from Saints. So, ultimately we arrive at the real experiential meeting with Christ -as I saw Him- where the Word is more than a text or voice heard, it is a reality spoken from time pasts, present and future, impressed upon the memory- like a picture never to be forgotten as you see with Michelangelo’s metric of person and nomenclature in the Trinity. The born-again experience is nearly identical with all who experience it. One example is hearing Franklin Graham on the radio in my car talking in the conversation mode of John Denver and George Burns in the movie OH GOD. Franklin was describing ‘his’ experience in the EXACT same terms as ‘my’ experience. I was just stunned listening to him. It was though both exact experiences came at the same time - from the same source to persons in very different places almost like Disciples speaking in tongues. Or Jesus traveling the world 2,000 years ago for 40 days without a boat or a raft- yet visiting civilizations in the New World as Joseph Smith learned. Speaking to them as future children of His. So speaking to Africans could be like speaking to Abbos in Australia where I studied, worked and traveled across that country 4 times in 30 years. If I were a preacher in Africa talking to 10,000 natives with a translator of sorts I would not declare hearing my words suddenly sent them all to Heaven in the Born Again experience. No, not hardly. Because Jesus’ message is for His church on Earth and all those who are called into this HOUSE OF GOD (as we will see the emblem of). This is in stark difference to getting into ‘a Paradise’ by disowning the world. The World is where the Word of Jesus finds it’s home. I would say something like this to my Abbos in Australia who have an extremely old and very well respected tradition. They are Image and Likeness too. Because one is the DREAMTIME and the other is the WALKABOUT. I would say to them that Jesus is a special guide from the Dreamtime and if you go upon a special Walk-about journey like Mormons send their kids on missions…and if you look for Jesus, then he may accompany you at some time upon your journey and show you the PATH that says life is special as I saw there with the Southern Cross over Alice Springs where there is no interference between Heaven (the sky) and the earth below- they are One. Anything else would be manufactured religion that accomplishes very little in the Kingdom of our Dreams. So today, in 2018, the true born-again experience is no longer a subject of conversation as it was with people in the ’70 who heard John Denver sing. No, that is not the Sodomite message Michael Jackson sang to Catholics. Why? Because few take or even know about this journey today with Ciber-space being the new moon rover. No, Christ is the metaphysical Journey in this life- at least by the light he shares, which incidentally as Masons know is held in the hand of Liberty. This was the importance of Cayce, Eddie, Ellen White, Joseph Smith, Castaneda, Blavatski, Augustine, Aquinas, Eckhart and others…. you learn to identify signs-as-messages from The Messenger. But beware of Messengers who claim they are the message as with Mohammad who is void of the Trinity and does not have the Holy Spirit. But does it matter? Well…. perhaps. Everything in traditional Western culture and iconography points to one message from one Messenger from one Source. And that is Jesus the Way to the Father, who sends his messenger The Paraclete… in a metaphor- that is why our Founding Fathers (mostly Masons) wrote the message in stone, icons, symbols, images and art. So? Our message is not from Ali Babba and the 40 thieves raising crescent moons to Allah on the road to their predatory Paradise. No. Here is the only Kodak picture that survived the deserts of Mexico -- a powerful image of a beggar with a money box and cross wearing tire-tread shoes in Puebla, Mexico. It is very significant because this is the corner Polish Pope Paul stepped out on in his first mission to the New World on the way to Guadalupe. Coincidence? Perhaps. But this street saint wears Shoes of the Fisherman starring Anthony Quinn who was from this very neighborhood. Yes? Is this way the picture survived? Possibly. Carlos said of all places in Mexico- this region was very special as the land of the Toltecs- the most ancient ones, long before Aztecs and Mayans. POPE JOHN PAUL'S 1ST MISSION AS POPE WAS TO GO THIS VERY CORNER IN PUEBLA, MEXICO where Anthony Quinn was from playing the Pope wearing these SHOES OF THE FISHERMAN. Go ask Morris West who wrote it in NSW as a preview of Jim Caviezel. So, now the life-long message from Mexico, I learned from leaving my ‘one and only’ like Pilgrim leaving his wife and family in Progress was a mission likened to the Emerald City taught in the message Michelangelo painted and sculpted – especially of Mary Magdalene sitting with Jesus -front and center- in the Sistine Chapel presenting the ‘advent’ of Jesus by DEFINING the relationship between man and woman where two on earth become ONE in Heaven. Yet they still deal with the same challenges. It is not like Paradise where the chattel are lined up for your pleasure. Yes finally, the MOTHER OF GOD has found her place next to Adams rib and the Arms of Jesus. The image of Mary is redeemed from stepping on snakes or riding on the shoulders of a little boy with the bull’s horns on the river of the wolf- Guadalupe. Here Jesus fulfills the human ontology by becoming One with Mary and thereby becoming an ‘Angel’ in Heaven as Michelangelo paints it. The Old Testament if rife with the laws between God and Man where wives (plural) were not ‘spiritual’ partners gaining entry into Heaven as ONE Entity… but only as progenitors and social partners. A lesson learned by Mormons. And it’s true- with many wives because it is not possible to become a unity in Heaven with concubines… even if many believed it from old as women servants were went with soldiers and horses into the afterlife. Why? It’s simple. Christ brought the Holy Spirit into the world which is the sole matrix for marriage. Michelangelo knew. It takes three to make marriage… Man + Holy Spirit (as matchmaker) + Woman. Bishop Sheen shown this light often in his homilies. No, Jesus is not the Holy Spirit. Jesus is the Son.. the Man that fulfills the contact between God and Man with the Holy Spirit as He said of Abraham: “I Am…. before you were”. Pope John Paul says “make the message known!” His painter of the Sistine Chapel sent him his orders ! hahaha….. but true that God so loved the world He gave His Son an everlasting wife who dried his feet with her hair: Mary Magdalene….…. defining the ontology between Human and Divine… with the creation of an Angel- born from the TRINITY. A picture is worth a thousand words….the Summa combines two Pythagorean triangles with the equation 3 squared x 5 squared = 9 squared, both back to back making a equilateral triangle. Given to me as a riddle to solve in a séance with Cardinal Ratzinger- Martin Luther’s 1st German Pope who walked away from Rome’s “deep state”. His revelation came thru his book ‘Introduction to Christianity’ with Image combined with Likeness. The German version of ‘Mere Christianity’ from Lewis and Tolkien. It is THE SUMMA of Christian tradition told by combining Image and Likeness. By combining the two right triangles -back to back- to make a pyramid OVER A SQUARE representing the Hebrew’s 10 steps up the Decalogue to the sacramental space that becomes the way and the door. The triangle on the right has the Greek images of Adam, Abraham and Jesus- and is the Man side. And on the Left side is Eve, Mother and Mary. Rationality is on the right and universal law is on the left. The rest is self-explanatory- God made man male and female- right and left and when combined with the Holy Spirit creates an Angel in Heaven as Michelangelo illustrates. In the middle of the book, like in the diagram above, we come to the sacrament of the Word spoken in the Holy Spirit. Here is one segment with Jesus speaking. Remember the Greeks who brought into the world the Spoken Word at their many spectacular amphitheaters throughout the Mediterranean. The Greek Amphitheatre is NOT a Roman coliseum. One was for the Spoken Word while the other was for rhetorical politics. Remember Jesus responding to the Abrahamic Jews saying "before you were, I AM " (because I AM the WORD). The Word was with God in the heavens above where the Greeks reached up to with their celestial oratory- for Heaven and Earth to hear and comment upon as of today. And this is the basis of the Heavenly Gods like Zeus and Hera where the great temple of Pythagoras was dedicated on the Island of Samos to Love and Marriage. So in a sense, the Born Again experience replicates the oratory between Heaven and Earth... with Jesus as the bearer of the Word. And in some respects, the bible's rendition of Jesus going to the Netherworld of the sleeping is in some respects like traveling into the mythical but real ancient cities from Gobeckli to the Maya. Truly a Netherworld existed for the ancients there in the real world like with the Greeks. The Born-Again experience is the Spoken Word transcribed from the Netherworld of multiplicity to a singularity. Like Theseus emerging from the Labyrinth. This is THE GREAT DREAM... written in the aura of Frazier's classic ancient book of the ETRUSCANS called NEMORENSIS - THE GOOD KING OF THE WOOD. Here....written in the similitude of a dream after returning from the Ancient Ones of Mexico to Texas in 1970.
"" HERE ARE AUTUMN’S GIFTS TO ME…… - which I share with you. “Have you not heard of Man and Man's great dream- the dream that fills the sails of travelers and builds in Eternity a destiny for all?" And I looked again at time and saw but a veil of illusion and beyond that veil was but oblivion so I turned from the river of mists to find this Great Dream….upon the face and in the heart of Man. And I laughed at my folly that had bound me so... but amidst my laughter, I turned to see standing before me an Old Hermit with a fierce face glaring through thick shaggy brows. So I walked to him and said, "Oh noble Hermit, friend of few and foe to the many... I have come in search of Man's house, a traveler who bears good will as his token of welcome. An outcast of fortune, a stranger to most and yet a friend to none. My only contemporary has been time.. from whose shores I have just parted. Beside that river, I sat till I grew dizzy with it's mirages. Now, I have heard the Winds say that Man's heart is noble and his soul is like the most distant skies. So if you will, please direct me to this great beginning. Friend of Fortune - what journey you long to take? Through those gloomy gates I have seen pass, souls more numerous than stars, and more distant in their journeys- those seekers of Man's House. I LISTENED to those well-tempered words, yet found them too hard and brittle, and said- "Too wise hermit, whose wisdom have you borrowed- the owls or the blackbirds? The House of Man may be an abyss- but no more timeless than Time itself... So give me no ill-fated omens, but direct me to this great beginning." NOW there upon the walls of this dark cave were the shapes and figures of Man's beginning.. graven into stone. Strange haunched creatures inflamed with hair... grimacing through long yellow teeth. "Oh strange is this darkness in which man begins", I whispered. Wide-eyed, I crept through this tunnel, waiting any moment for a phantom to reach out and draw my life upon those grim walls. But there- amidst my doubts and fears, I saw a LIGHT approaching and as it drew near, a VOICE called out, "Behold you who venture through these depths I AM REASON- the Son of Thought, the Light and the Liberty of Man." And there He stood with a fire burning in his right hand. Long have I stood upon the shores of my beginning, until one day the winds did say to me, "Have you not heard of Man, . and Man's Great Dream? The Dream that fills the sails of travelers and builds in Eternity a destiny for all"? And when I looked again at time, I saw through it's mists- a veil of illusion... and beyond that veil was but oblivion. So I crossed the River of Mists to find my fortune with Man's Great Dream. When I had finished speaking Reason looked long into my eyes and said: " Come my young traveler and read the signs written upon these walls: the Beginning... and the End... and the Beginning again. He who reads the signs knows the fate and the fortune of Man." So thus we began our journey - into the past and into the future. As we walked among the life-like images, Reason began: "Man is an animal- as you see, was, is and will always be. He rose among the animals as a victor who conquered and mastered each and all of their best arts. He first became sly and cautious like the snake, then grew cunning like the wolf, and with a sly cunning conquered the mightiest and the strongest. And with their great strengths grew proud as the Eagle and noble as the Lion. Yet there rose Faces that his pride and his strength could not conquer. Over these his strength and pride would not rule." Now, at this point in our journey Reason grew silent and stopped to look ahead. And I turned to Reason and said: "Oh Reason, what is this darkened pit that we have entered?" And Reason replied, "Here... is the sun-less land of thought's beginning... the land of images fed by fire - magic - sorcery - and moonlit dreams dwell here. It was a great beginning for some- yet many could not deny this God of Fear that ruled their earliest passions. "Fear and death, into the abyss..." the voice still echoes in their hearts. ………..Now my young friend! Reason only laughed and replied: " My young friend, I go with all men and all men go with me- for all men share the same destiny. Now here, take of this fire of mine- for never will it go out. And hold it close to your heart to know it well- for some day it will be the light and the lantern for your most distant journey." blood sacrifice with a modern twist. Every man shall have his pyramid and all shall be Pharaohs- even women. And the fruit trees were waving in the wind- proud of their heavy branches. (YAKIMA). So I climbed up through the branches to the very top and looking into the nest saw that it was Wisdom's very own. Yet with a close scrutiny, saw that the nest was empty. And at that very moment- all the birds grew silent and turned to me to see if I too would start to sing. THAT WAS A CHAPTER IN THE BORN-AGAIN EXPERIENCE that SCRIPTED the following 40 years of my life in a thematic setting of icon and events. Written to the letter of the Word spoken. Now let us return to Mexico and our LADY OF GUADALUPE and the BOY RIDING the bull. Guadalupe did not speak to me while living in the desert of Toltec and traveling in Mexico by van and horseback. But Guadalupe did speak to me in Ecuador with Miss Ecuador (runner-up Miss Universe). We were at the beach with her family. Her father was Secretary of State and her grand-dad had been President. Once again like Consuelo long ago, we were engaged but events were to play out to change the outcome. One event was something spoken to me from the Agape cactus outside the house. I think it had to do with the fact that her Martha Stewart cooking show in South America was not moving to my cooking show café. One reason was she was not Catholic but worked for a Baptist TV station. And the mission the Pope sent me on was to convene with his friend Archbishop Cisneros and get the calling from him. THE BULL ....... the later chapters of the book are stories from Alaska to Panama in a work-truck and trailer for fish farming with Texas Sea Grant technology for How To Save the Oceans and the Seas… patents and technology are shared on how to prevent the pollution of the oceans. But Guadalupe? What does it mean? How can it be explained? How can it be divined? Upon reflection we see many of these iconic events are signs for the future- especially in South America. The only icon in Mexico is Our Lady of Guadalupe. So how can she become a player between Liberty, Christ in Rio and Solomon’s Temple in San Paulo. We remember the TRINITY is formed in the Summa as a symbiosis of Image and Likeness we saw from Ratzinger and Lewis and PJP. Where image is the left half and likeness is the right side to make a perfect pyramidal triangle as the Summa of Tradition as the House of God replicating the idea of Augustine's City of God. Ontologically, both PJPII and President Reagan entered the stage of human prophesy and history. Each would almost be 'assassinated' a month apart as each represent the two horns of Guadalupe, because Guadalupe is a message that has not yet been fulfilled. This is why vandalism, bombs, carelessness and time have no effect on this oracle for our future. Lady Fatima was an abortion. But Medjugorie is where PJP said America and Russia would be saved. But America cannot be consecrated without Mexico. So the mystery of Guadalupe must be unveiled as with Medjugorie. The Bible-image of the Woman who bore Jesus having the job of stepping on snakes is contrary to the image of Moses and Jesus holding the ‘image’ of holding up the snake- captive to offering healings. What is the message? We must look again at the lands of the Ancient Ones in Mexico to Peru and Bolivia too, because this is the Key to the Consecration of the Americas with Trump and Francis going to the Temple of Solomon in Brazil together. Medjugorie may be the catalyst. But Mexico cannot descend into the quagmire of drugs and corruption that we lived through in Venezuela under Chavez. And it is no small token that Columbia feeds America its cocaine like giving candy to children because the American Dental Association gets 90% of its work from children getting cavities from candy. Coincidence? Not likely. So how does a continent of nations reconcile itself to truth and good works as the Founding Fathers set the stage for- even after the Civil War instigated from Muslim slavers from the Shores of Tripoli to the Halls of Montezuma? Only a miracle can do it. Remember, the Monroe Doctrine was something like Augustus said about Rome- “It is an eternal IDEA in the mind of God”. Place? Yes. But IDEA first. And now with the prophesies fulfilled from Madam Blavatski’s marvelous book ISIS UNVEILED, and Mohammad’s daughter at Fatima only a ceremonial center for pomp oms, we ask how did Reagan and PJP succeed in stepping on the snake of Communism. It really was a miracle in action. We must consecrate the New World to Christ and make the Americas an emblem from Liberty on Staten Island to a redeemed Guadalupe to Christ at Rio and Solomon’s new temple in San Paulo. A lesson was learned losing Venezuela. Perhaps I failed in my message from the Pope. I should have accepted the invitation from his helicopter pilot across the hall from mother-in-law to go see him in Caracas. But the country was so corrupt, I could not see the purpose. Our web site was taken down. The T-shirts no longer went to the street vendors in Maracay. Maria’s mother took her to Florida to be with family and now the nation eats cats, dogs and flamingos. Chavez like Obama defeated every element of free enterprise in Venezuela. But perhaps this can be a lesson in learning as President Trump is instructing the world about the caprice of Clinton and Obama and all the dishonest government operatives. As Edgar Allan Poe wrote in the Pit and the Pendulum, as long as the pendulum swings from Left to Right and back again the world is victim to the Pit. So Trump like Reagan is not from the quagmire of the swamp or the pit. But he has stopped the pendulum. So now the road… the path.. the Way.. the middle path is open. And this is the essence of the Trinity with Christ. May he lead us forward to consecrate the Americas with the Message from Saints. And so we pray.